With deep sorrow we inform you of the sad demise of respected Sh. Tilak Raj Kapoor on Wednesday 23rd Dec. 2015. Antim Ardas will be held on Sat. 26th Dec. 2015 between 3-4 pm at Gurdwara Nanak Piao Sahib, G.T. Road, Delhi. In Grief: Smt. Sudesh Kapoor (Wife), Brothers & Sisters, Children & Grandchildren. The few golden years you blessed us with, remain etched on our hearts, mind and soul. May you smile forever. We love you. Prayer Meeting Shivraj Gupta (2010-2015) To be held on Monday, 30th November, 2015 at Chinmaya Mission, Lodhi Road, Delhi, from 4- 5 p.m. 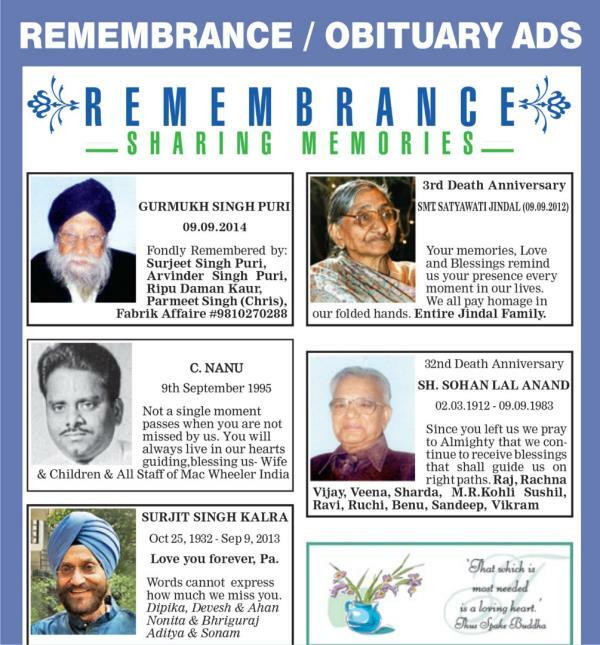 In Grief: Raghav & Ambereen Gupta (Parents), Grandparents & family. With utmost grief we inform the sad demise of Sh. Ram Gopal ji (13.02.1926-27.02.2014) Rasam Pagri will be held on Monday, 10th March 2014 from 3 to 4 pm at Maharaja Aggarsen Bhavan, Sec-19, Old Faridabad. Grief Stricken: Chanderwati (Wife), Sons, All family & friends.